Bowflex Hybrid Velocity Reviews - What Is It And How Does It Work? Bowflex Hybrid Velocity Reviews – What Is It And How Does It Work? Bowflex Hybrid Velocity Trainer is a fitness product designed for use in homes and by those who find it hard to go to gyms. It’s a device produced to incorporate regular cardio as well as resistant training into much busy lifestyles. This device is home gym equipment made from the use of modern technology, and it provides the user with fitness required and ability to workout any time according to one’s convenience and living space. It helps those that are disciplined in workouts to gain lean muscle mass, lose excess fats and energy as well as helping to elevate their metabolism. This device is sold online and one can buy it from the brand’s official website. It’s sold at a cost of $1,799, and it has subsidized shipment and money back guarantee. It’s produced in USA by a well-known company in producing safe and effective fitness equipment. What Are Bowflex Hybrid Velocity Trainer Claims? Bowflex Hybrid Velocity Trainer is a fitness device designed to be used in homes. It works by combining cardio and strength training into a single fitness machine. This device is claimed to give rapid results to those disciplined in gyms workouts. This equipment is claimed to allow about 50 different exercises that are said to combine strength training and cardio training in 18 minutes, thus enhancing body transformation. It helps in enhancing muscle activation, calories burning and muscle building. Bowflex Hybrid Velocity Trainer Review- How Bowflex Hybrid Velocity Trainer Works? This equipment comes in 2 boxes containing all hardware required to set up the device and in exercises. It helps the user to perform about 50 different exercises in 18 minutes that involve cardio and strength training, thus helping in body transformation. This device is formulated to reduce the amount of time spent in gyms. It’s also good for those that would like to stay fit but lack sufficient time to go to gym, as one can perform exercises at one convenient time. 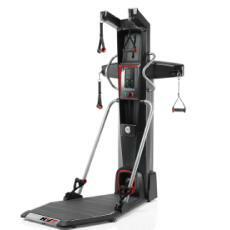 This machine is an upright one that incorporates adjustable arms, which are used to perform various exercises. Pulleys– this device has 3 different pulley positions that include lower, middle and upper which perform specific muscle categories. Each one is attached to a hand grip. Platform– this is a slightly raised stage which defines the workout area. Media Shelf– this is the place where one stores his or her training guide. Console– it provides details about workouts on the display machine. It provides information such as calories burned, amount of time spent during each exercise among other tracking details. Bluetooth Connectivity– it allows those exercising to connect this device to a smartphone app. The app is available for both the Android and iOS smartphones, and it provides high functionality level. This device is designed by a well-known company in producing safe and potent fitness enhancing equipment. It’s designed to be used in homes, thus its good equipment for those that find it hard to go to gyms. It helps the user to perform a wide range of strength and cardio exercises in just 18 minutes, thus helping the user in body transformation. Customers complain that this product is much expensive. It can only be ordered online and it’s illegible to international shipment. This equipment comes with a guide that directs you on types of exercises to perform and for how long. There are no records of side effects possibly due to the use of modern technology while coming up with this equipment. Bowflex Hybrid Velocity Trainer is a fitness device designed to be used in homes. This equipment is designed to help the users to perform about 50 different exercises in limited time, thus helping in strength and muscle gain. This machine is claimed to combine both cardio and strength training into single fitness equipment. It comes with a user guide and smartphone app that helps to direct the user on types of exercises to perform. It also has a display screen that helps keeps the user informed about the time spent, calories burned and exercise performed. This device is sold online and it has subsidized shipment price and it also has money back guarantee. However, this product is can only be ordered online and it’s illegible to international shipment. Details provided in this product review are insufficient to make conclusion about the effectiveness and worth of this product. Therefore, it’s good to find out some details, compare with competitor equipment and then make a wise selection.